It's not surprising, 30 children and 30 computers create the same heat as a 7kw electric fire and with all the windows sealed for security purposes, it's impossible to cool the room. Fortunately there is an answer. 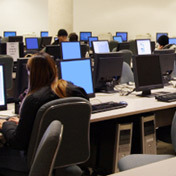 At ACS we have vast experience installing air conditioning in ICT suites. We can design a system that will create a comfortable, temperature controlled environment, enabling your pupils to concentrate for much longer and attain the required results.